This bitter cold gripping Connecticut brings back frigid memories of when I first moved to Michigan. It was early December 1990 and the ground was already covered in snow and the temperature was settling in for a solid 90 days of hovering in the teens. The sun made rare appearances. It hurts just reminiscing about it. 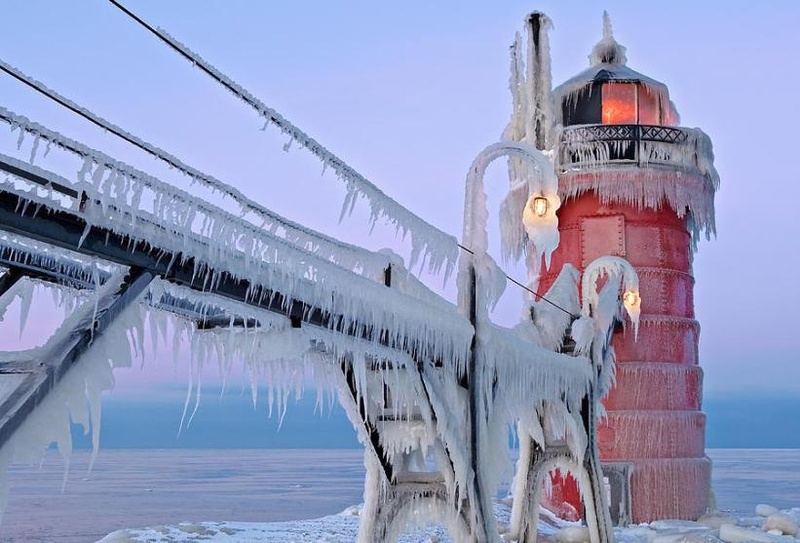 I grew up in Massachusetts and was moving in from Illinois, hardly tropical states, but their winters were wimpy compared to the Great Lakes State. Those first few weeks of living in Michigan were brutal. Within a week on the job of reporting in the field, I had purchased long underwear to wear beneath my suits. It was the only way to cope. A month into that new job at WWMT in the wonderful month of January 1991, I was out covering a story in a howling snow storm. Photographer Pat Martin and I were leaving Grand Rapids in our news car and somehow got lost looking for the Gerald Ford Expressway. What happened next, became the stuff of legend at West Michigan’s CBS affiliate. We were driving down what appeared to be a road near the Grand River, a road that was completely covered in abundant lake effect snow. We couldn’t make out the end or sides of the road, and there were no tire tracks ahead to guide us. That’s because it wasn’t a road, and we soon learned that the hard way. Unbeknownst to this intrepid and somewhat rookie news crew, the Grand River had flooded over its banks and frozen over and then was dumped on by snow, apparently again and again and because it is Michigan, again and again. We couldn’t see any water and it looked like a road. 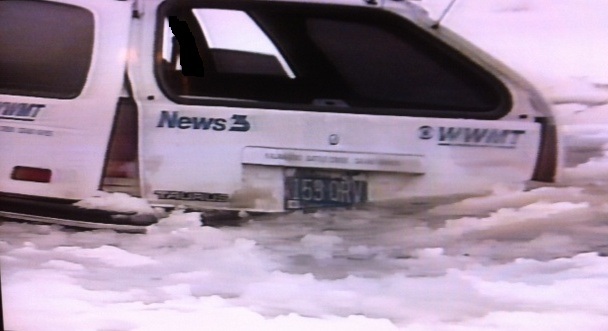 There was no GPS back then to tell us we were driving on a sheet of ice above some extremely cold water. 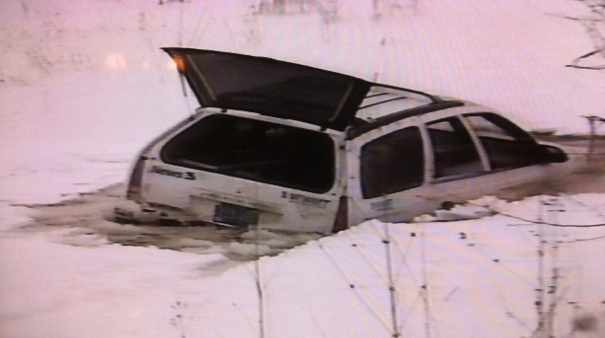 With a loud crash, our Ford Taurus wagon took a plunge through the snow and ice and into the water and started to sink. Pat and I quickly crawled out the windows to escape the waters that were now gushing through the vents and dashboard. Pat grabbed the camera out of the back and we slogged our way to safety. Fortunately, something under the surface prevented the car from completely disappearing into the dark, slushy abyss below. Our news director Perry Boxx wasn’t exactly pleased with what happened, but was relieved we weren’t hurt. The Taurus wasn’t so lucky; that was its last news assignment. Pat and I kept our jobs, in fact, Pat has enjoyed a great career at WWMT, 21 years after taking some undeserved ribbing from our colleagues, who dubbed him “Captain Nemo,” among other names. Truth be told, the sinking was probably my fault. As any news crew will tell you, it’s the reporter sitting in the passenger seat who usually does the navigating. Should Connecticut Consider Becoming a Right to Work State? Fantastic – lucky you both survived it for sure. I don’t think you should be making fun of Kara’s driving! or is that Scot? I’m glad you guys weren’t hurt, but it’s hilarious. TG no one was hurt. I can assure you, we had not been drinking! If I was President at the time, I would of relieved you of your post. 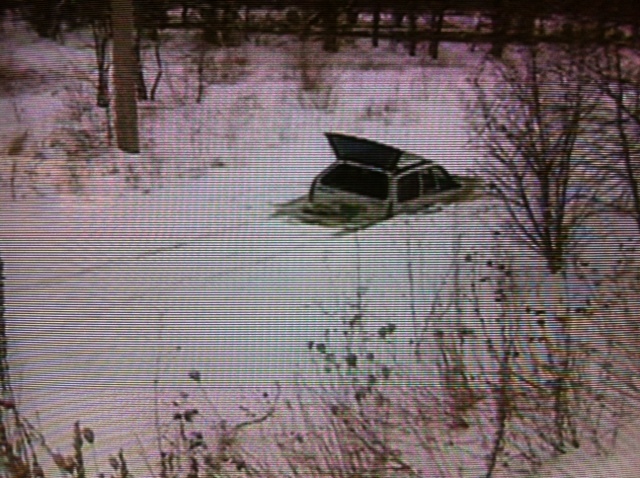 If that was a Roadmaster, it would had gone straight to the bottom!! No cheap Ford sheet metal, just solid GM steel ! !